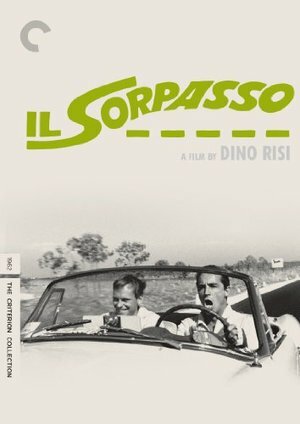 The ultimate Italian road comedy, Il sorpasso stars the unlikely pair of Vittorio Gassman (Big Deal on Madonna Street) and Jean-Louis Trintignant (Z) as, respectively, a waggish, free-wheeling bachelor and the bookish law student he takes on a madcap trip from Rome to rural Southern Italy. An unpredictable journey that careers from slapstick to tragedy, this film, directed by Dino Risi (the original Scent of a Woman), is a wildly entertaining commentary on the pleasures and consequences of the good life. A holy grail of commedia all'italiana, Il sorpasso is so fresh and exciting that one can easily see why it has long been adored in Italy. The ultimate Italian road comedy, IL SORPASSO start the unlikely pair of Vittorio Gassman and Jean-Louis Trinitignant as, repsectively, a waggish, freewheeling bachelor and the straitlaced law student he takes on a madcap trip from Rome to Tuscany. An unpredictable journey that careens from slapstick to tragedy, this film, directed by Dino Risi, is a wildly entertaining commentary on the pleasures and consequences of the good life. A holy grail of of commedia all'italiana, IL SORPASSO is so fresh and exciting that one can easily see why it has long been adored in Italy.